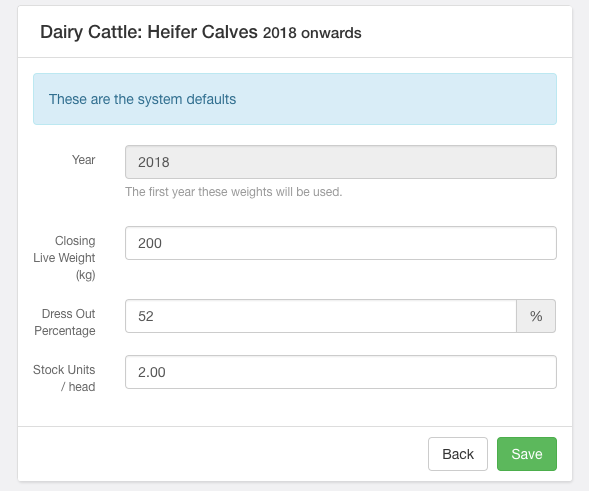 Within each livestock tracker settings, you're able to select to configure the weights for your selected stock type. You can customise the weights per year by using the year selector at the top of the configuration page. From there, you can hit Edit on any particular stock class and update the closing live weight, dress out percentage, and stock units per head. Once done, hit Save and move on to configuring the other stock classes as desired. NOTE: If you're a part of an organisation, you can instead choose to set and use organisation defaults for stock weights.